A man (Mads Mikkelsen) takes shelter in a crashed light aircraft, one that has been half-buried in the snow of the Arctic tundra. He lives alone, the sole survivor of a deadly crash. When a helicopter arrives and, in the most disastrous of coincidences, crashes as well, he finds himself caring for a badly injured survivor (Maria Thelma Smáradôttir). Realising that she will die without urgent medical care, he sets off on a near-impossible trek through the wilderness to ensure she survives. Arctic is simply tremendous. Writer/director Joe Penna (with Ryan Morrison co-writing) has taken what could easily have played out as thinly-drawn stereotypes and transformed them into something deeply effective and oftentimes surprisingly profound. Not only has he achieved this, but he has achieved it in a counter-intuitive fashion: not by adding and embellishing moments of back story or character, but by stripping them away. The less detailed the survivor’s story becomes, the closer it comes to a universal experience. Mikkelsen’s protagonist – we only know his name is Obergard because we get a momentary shot of his ID – could be anybody; as a result he feels like he could represent everybody. He is a human being who survived, and has nothing else to do but keep living. It all presents an enormous challenge to Mikkelsen, who spends pretty much the entirety of the film acting along. Acting is reacting, as the great Constantin Stanislavski maintained, but when your one co-star in effectively in a coma for the entire film there is precious reacting for Mikkelsen to do. He is marvellous, bringing varying subtle layers of emotion to what is in essence a black slate. He is tremendously engaging. Thanks to cinematographer Tómas Örn Tómasson, the isolation and bleakness of Obergard’s experience is palpable and intensely delivered. It takes a long time for anything to get going. Instead the film spends its first act putting Obergard into a low-key, constant routine. We do not know how long he has been camped out in the snow, but the impression is that it has been a long time. We are clearly past any time when he felt hope or despair; now he simply survives. That sullen, accepting tone blankets the entire movie. There’s no obvious indication on whether Obergard will save the woman in his care, or indeed whether he will survive his perilous journey to a distant research station. The film, like Obergard himself, lives from moment to moment. That generates tremendous suspense, delivered on a deliberate slow burn. Early on Obergard discovers a bear’s footprint in the snow. Looking to the horizon he can just make out a wandering polar bear scavenging for food. He sees it, and looks rather apprehensive about it, but for the rest of the film the viewer is left in suspense waiting for the polar bear to re-appear. Strip out the dialogue, and abandon any strong element of backstory, and you are left with a pure sense of cinema. Obergard’s entire character is left defined by action. The film is so sparsely populated and so eerily simple that the emotions stand out in vivid fashion. For Joe Penna and his talented crew, and for Mads Mikkelsen in particular, this is a tremendous achievement. 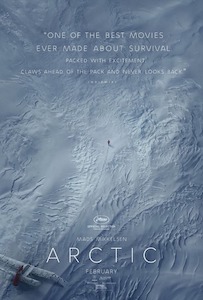 Arctic opens in Australian cinemas on 14 February 2019. I’m so excited about this and really want to see it. I just read the interviews with both Mads and Joe Penna on the plane and I am glad it’s good.